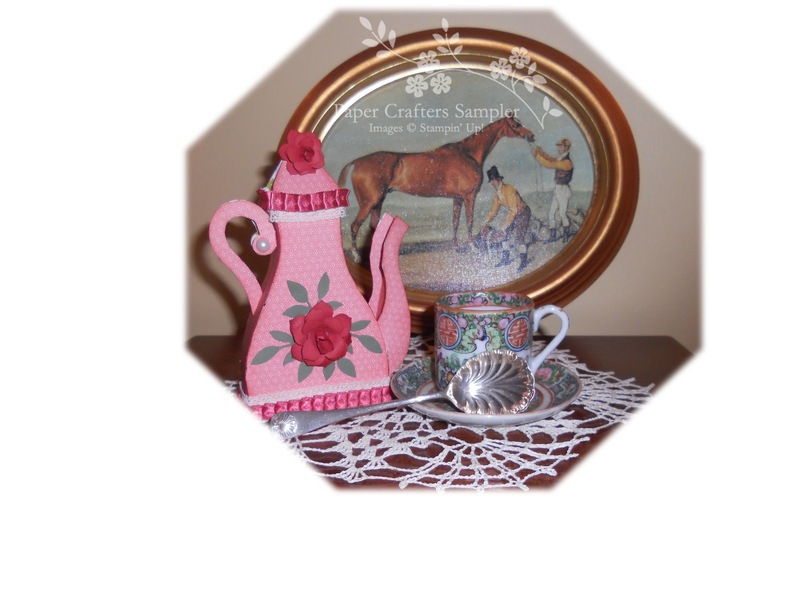 The Shabby Stamper: PCS High Tea Blog Hop! 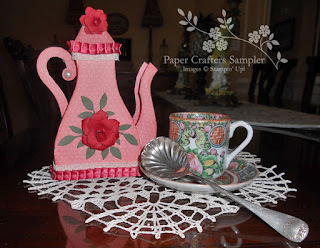 Welcome to the Paper Crafters Sampler “High Tea” blog hop featuring our 3D teapot template from the March issue of the Paper Crafters Sampler entitled, “Orange Blossom Tearoom”. With the current trend of tea images in the paper crafting world, it only seemed appropriate to offer a tea-related template, and that is our newest “High Tea” 3D, teapot. Now-a-days, teapot come in so many sizes and shapes, it was easy to select one for my inspiration. Here is my interpretation of this fun template! Leave a comment here on this post by Friday, March 30th and you will be entered into a drawing for a FREE copy of this months' Paper Crafters Sample which includes 8 fabulous projects and this adorable template so you can make your very own teapot. Now feel free to go back and take anotherMelanie Schulenberg's teapot images or select the “Click Here” button before and hop on over to Vicki Burdick's blog! Love the ruffle effect! Your teapot is so elegant looking. Very girly tea pot... I want to have tea with the girls. Cute! So cute! Love the ribbon! Love the colors and the elegant look that the flower brings to this teapot. TFS. Super sweet Lisa! Love the colors you used and your pretty rose is spectacular!!! These teapots are amazing. Thanks so much for sharing them. This is just beautiful!! Love that added pearl and that rose!! This is absolutely divine!! I can't wait to make one!! Your teapot is gorgeous! Love the pleated ribbon embellishment; and that your flower is the focal point! So, so pretty! How gorgeous is your teapot! WOW!! This looks great Lisa. That ruffled ribbon is so feminine; perfect for a ladies tea. Love the pinks in your teaspot! How feminine this is! Perfect for Mothers day coming up! Fill with candy or have flowrs out of the top! LOVE IT! it is sweet, I love the color match. Great color combo on the tea cup...a lovely inspiration for your tea pot. I love the paper roses on the front and really like that pearl you tucked in the crook of the handle...very pretty! What a fun project! I love your little teapot! So pretty! and so girly! Wow!!! Love the bold flowers against that pink teapot. Beautiful! Your teapot is super cute! I am a pink girl at heart so your version of the template was the one that made me go awww! TFS! Beautiful! Like a Mary Engelbreit teapot!